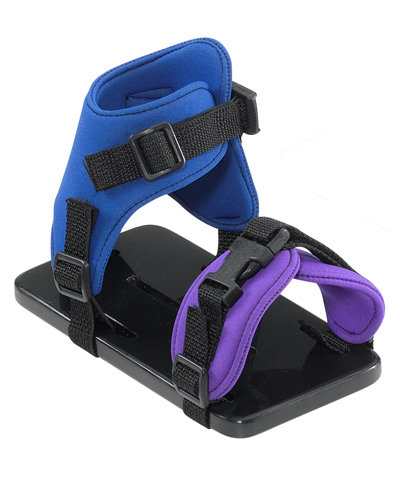 This accessory consists of a pair of ankle positioners (made from Neoprene) that are mounted to a footplate extender (made from high density polyethelene) with a pair of toe straps mounted on the front of the footplate extender. This will be beneficial to a client whose foot/ankle positioning needs exist but the placement of the ankle positioner is not certain or may need to be changed in the future. The footplate extender to which the ankle positioner is mouinted, is slotted and pre-drilled for easy mounting to the footplate of the wheelchair as well as easy to adjust placement. The toe straps mounted at the front of the footplate extenders will help keep the foot in line with the direction of the footplate extender. If color other than Black Neoprene is desired, replace the last two letters of the model number (NB) with those from Color Selection section. i.e.- FPS-NB becomes FPS-NE when color Eggplant is desired.